We could begin seeing fewer emojis in the world as Apple has begun cracking down on how its iconic emoji designs are used. Over the past few years, Apple has come to embrace its emojis as a fully-fledged part of its brand. Press releases have led with the emoji updates and one flagship feature of the iPhone X is its 3D-animated Animoji which is promoted heavily in Apple ads. What has been confusing and/or taken for granted by many people is the way Apple's emojis have been used in apps on non-Apple operating systems. Until now. WhatsApp used Apple emojis on Android for years, and only recently created its own emoji set for use on Android and the web. Slack, too, offered Apple emojis on all platforms until today. Whether these changes were due to pressure from Apple, or a growing realisation that this might not be the right way to go about cross-platform use, we don't know for sure. Other apps such as Signal and Telegram continue to use Apple emojis on Android. These steps have made sense, given that Apple does own the copyright to its emoji font and a casual user looking at an Android app with Apple's emojis could easily mistake it for an unusual-looking iPhone. 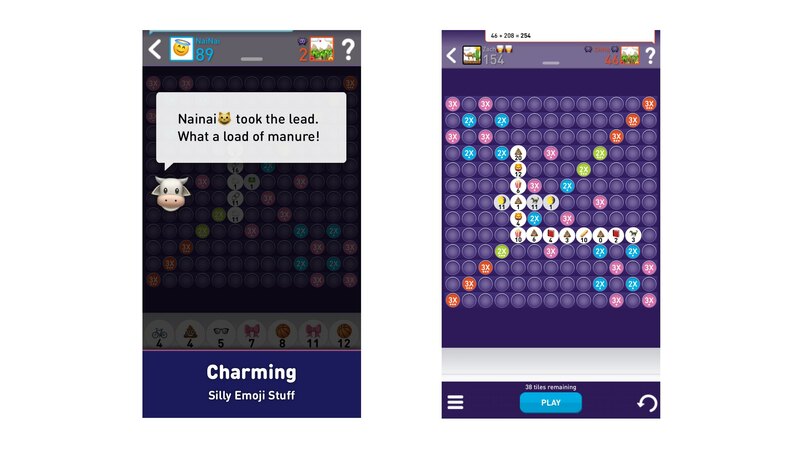 Now app developers are getting word that the use of emoji in iOS apps may be stepping over the line too. 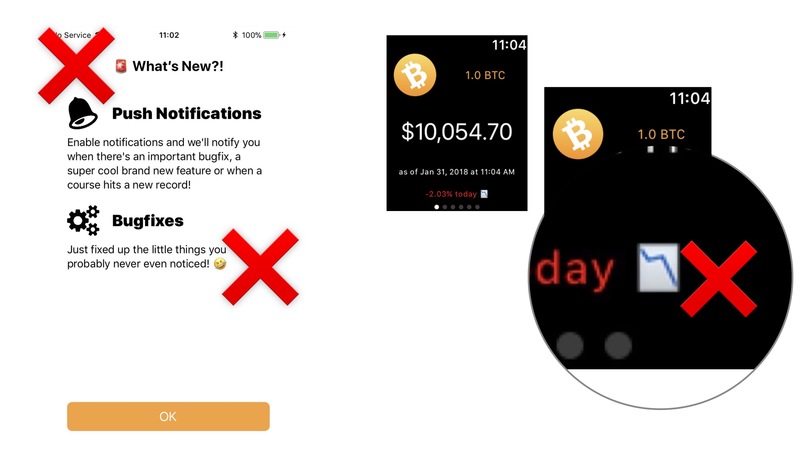 Last week app developer Sam Eckert reported that an update to his iOS app BitTracker was rejected by Apple due to lack of compliance with its guidelines for trademarks and copyrights. Specifically, emoji use in BitTracker was called out as being problematic in both the iPhone app, and a small 📉 Chart Decreasing emoji used in the watchOS app was also an issue. Above: BitTracker was rejected from the App Store for this emoji use. This is not the first time this has happened. Eddie Lee, developer of app Reaction Match, reported a similar incident dating back to December 2017. This stemmed from a screen which used the 😭 Loudly Crying Face emoji as the heading for a Game Center error, and three 👾👾👾 aliens on the same screen. Above: The emojis that weren't allowed in Reaction Match (left) and the approved screen that removed them (right). GitHawk, a Github client, was also rejected for emoji use within the app in January 2017. These emojis were primarily used in the context of emoji reactions. 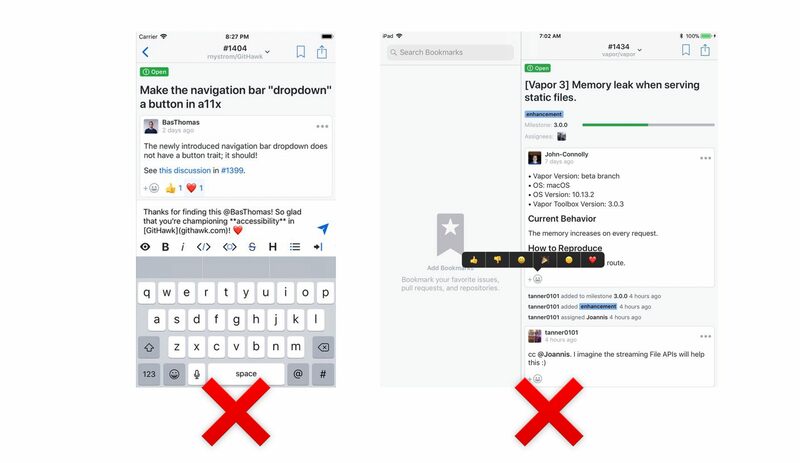 First created by Slack in 2015, these are now a common feature across all kinds of communication environments. Above: GitHawk was rejected for the emoji reactions feature using Apple's emojis. Notably, Apple's own App Development with Swift course gives tips on creating an app that appears to breach these new guidelines. To help navigate what appears to be going on here, we have compiled a guide for what is and isn't allowed by Apple when using their emojis. This has been created based on feedback from numerous developers over multiple days. Please note that this isn't official guidance from Apple. It is merely a collection of what appears to be the new status-quo. ❌ Don't use Apple emojis in your App logo or icon. 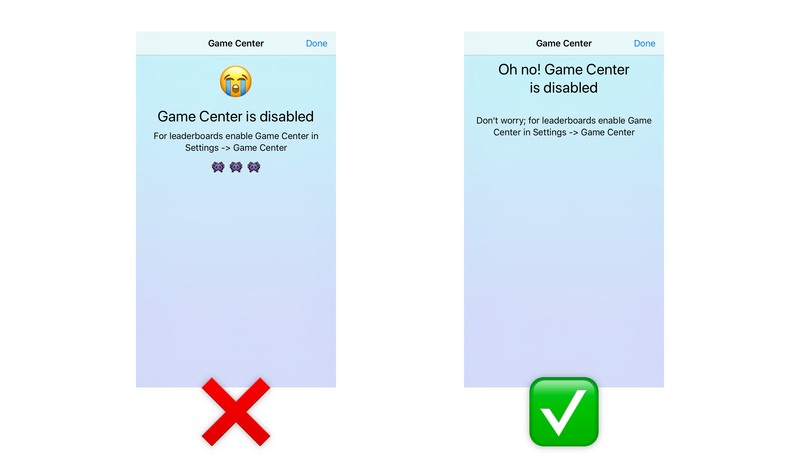 ❌ Don't use Apple emojis as sprites or elements of your game. ❌ Don't use Apple emojis as a replacement for your app's buttons or other UI elements. ❌ Don't create sticker packs that look too similar to Apple's own emojis. ❌ Don't use Apple emojis in App Store promotional images. 🤷 Apps love to use emojis in push notifications. Is this permitted? It's not clear. 🤷 Using Apple's emoji in app copy (text) anywhere seems to be a fuzzy line. Some developers seem to have been allowed in-line emojis as part of text, but others have been rejected for this. It seems like it could be off-limits depending on the interpretation of the specific reviewer. 🤷 Screenshots don't seem to be the issue at hand here. If your app is deemed to have "appropriate" emoji use, then screenshotting that should be fine. 🤷 Keyboard apps that include an emoji keyboard. Where do they stand? Perhaps this is an exception as there is no better way to do an emoji keyboard than to use Apple's emojis (it would be weird to have the keyboard use another emoji design) but it's still not clear. 🤷 Chatbots: they are like a human responding to a text. They frequently use emojis. Allowed or not? We're not sure. ✅ Allow user to type emojis into any text field. This is standard OS-provided behavior. ✅ Anywhere a user types an emoji, you can display this safely. ✅ Rule of thumb: if a user types it, it's allowed. If not, it probably isn't. It remains to be seen whether Apple extends this crackdown to larger players on the App Store. Notably, Snapchat features emojis in its UI quite heavily. In fact, the entire friend list ratings system uses a series of emojis to depict what type of friendship you share with someone. Given that it is Apple's store, they can choose to enforce their own guidelines as consistently or inconsistently as they see fit and there isn't much that can be done about that. One might assume that popular apps might be given more time to comply with these new rules, or simply let them be exempt. A tough pill for smaller developers if that is the case. One question that comes up a lot is whether apps can simply license Apple Color Emoji. To the best of my knowledge, Apple does not have any licensing arrangements for its emoji set. Every design within Apple Color Emoji (Apple's emoji font) is © Apple, and they can do as they please when it comes to enforcement. Even moreso on their own App Store. Apps using Apple emoji images on other platforms might consider the recent switch of WhatsApp and Slack to non-Apple emoji on Windows and Android to be a warning that they might also want to do something similar. The discussion of what is permitted on the App Store isn't one about legality, it's simply a matter of what Apple decides it wants to do for its own store. It's an important distinction to keep in mind no matter what you might think about its decisions. 🧒 Smaller developers will be hardest hit as Apple's professionally designed emojis were a quick and easy way to provide imagery in an app that fit in with the system. They will now need to create their own icons to fill the gap, embed a licensed emoji set, or have a naked-looking UI. 🧑 Larger developers have the budget to create their own emoji or icon sets, or to license existing ones. The largest or most popular apps may see Apple overlooking breaches of this new policy. 👨‍👩‍👧‍👦 End users might notice that apps start to use a different emoji set anywhere that isn't user-inputted. This might result in a weird mish-mash where apps could use Twemoji or EmojiOne for a heading, but then Apple native emoji for text input. This doesn't seem like a great outcome, but I suspect rather than using other emoji sets developers may just choose to use different imagery altogether. 👽 Developers of apps for Android or Windows, while not directly under any control of Apple, may want to start looking at alternatives if currently embedding Apple's own emoji images in their apps. Now that Android and Windows have good and up-to-date emoji support, going native seems the best option. Apple is within its rights to decide the terms under which its emoji designs are used. Looking at some of the examples here, I do think that some leeway should be given for "emoji within copy / text" as that appears to be within the spirit of how emojis should be used. It would be a shame to see emojis banished from all apps due to potentially over-zealous app reviewers. Using an emoji as a core part of an app's UI, or in-game character seems to be overstepping of the mark, and now that Apple has begun enforcing this, I don't expect that side of things to change. It's understandable there is much confusion about this right now, especially as the Apple Color Emoji font until now has been treated by many as a font like any other. If this is thought about as "a set of images created and owned by Apple", the terms for what seems reasonable do shift. After many years of a laissez-faire attitude to its own emoji set, we're only now beginning to find out where Apple deems the lines to be drawn. When it comes to iOS app approvals, none of this is necessarily set in stone. I'm hoping a reasonable middle-ground can be found that works for Apple, and app developers. Are you an app developer that had an app rejected for a reason not listed here? Contact me with your examples. We have reached out to Apple for clarification on its guidelines for emoji use but have not had a response at the time of publishing. 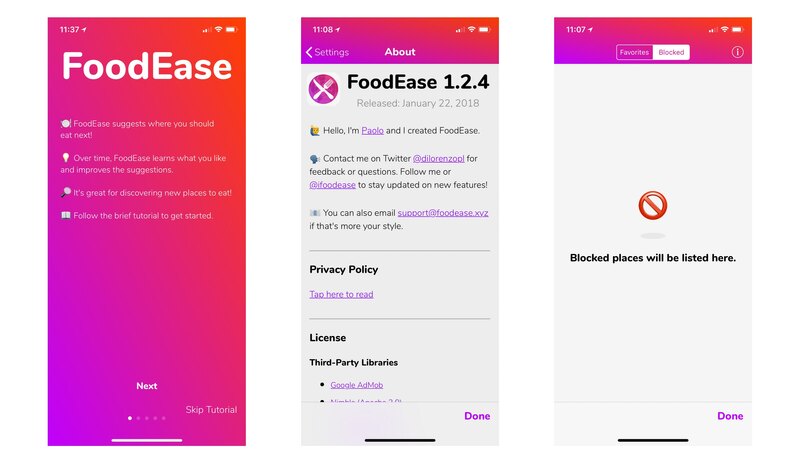 Above: FoodEase was recently approved with emoji being used in similar ways to rejected apps. Update 2: Feb 7, 2018. MojiMatch was rejected for using Apple emojis. Switching to an EmojiOne was the answer in this case. Update 3: Feb 7, 2018. Is Apple having easing up on these emoji restrictions? BitTracker has just been approved with the same emojis included as before. Update 4: Feb 8, 2018. I spoke with Myke Hurley, Stephen Hackett and Federico Viticci on Connected FM this week about the different ways Apple seems to be cracking down on emoji use. We still don't really know where they stand on this. Update 6: Feb 8, 2018. Casey Newton at The Verge says that Apple has “not responded to repeated requests for comment” about emoji use on the App Store. Update 7: Feb 9, 2018. The Accidental Tech Podcast covers this topic and while not being able to clarify the rules, Marco Arment does make a good point that regardless of legality, it's potentially in Apple's best interest to have App Store apps look good, and consistent. If all used various other emoji sets, it would have the effect of making iOS look worse overall. Update 8: Feb 13, 2018. Michael S. Young reports that his app Treasurys was rejected for emojis that have been in place for five years, using emojis as UI elements. Specifically: as a slider control, fast-forward, and rewind buttons. Above: Emojis-as-UI-elements like these buttons and sliders have been rejected in the previously-approved Treasurys app. Update 9: Feb 14, 2018. Happy Valentine's Day! PCalc has been approved with emojis intact. This is a fairly modest implementation, and more 'label' than 'UI'. Are we starting to see a common-sense approach to all of this? Perhaps. 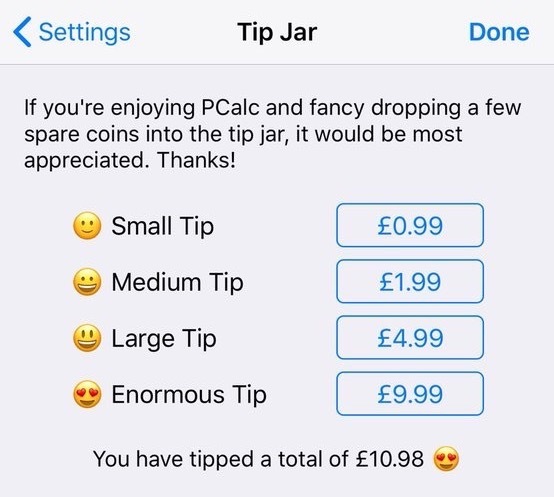 Above: PCalc uses emojis to indicate a level of appreciation in using the app and has been approved with these intact.